I often group books into three categories: shallow, still touching the bottom, and deep. A shallow book is enjoyable for its effortless readability. I can pick it up whenever and read it even in the most chaotic situations like a pediatricians office in flu season. If a book is “still touching the bottom” I am reading something that requires a little more investment and concentration. Lastly, a deep book requires more of me. I need to read it in a quiet room and focus on the unfolding plot. In Price of Privilege, I found myself in the deep end of the pool for all 446 pages. First of all, this book does not stand alone. You do need to read the prior books before reading this title. Jessica Dotta has written an intriguing trilogy and each book is essential to the story. Picking up right at the end of the very dramatic and emotionally taxing drama might leave you confused. Having said that, it is absolutely worth it to read all three. 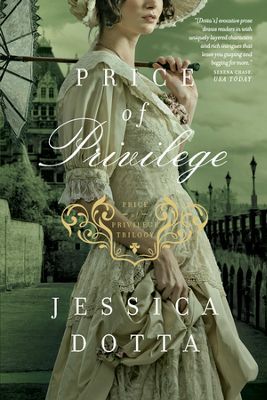 In this final installment of the Price of Privilege trilogy, Julia Elliston has managed to marry her true love, Edward. They spend only a few wonderful pages in martial bliss before they are on the run. Finding refuge only in the home of her father, Lord Pierson, Julia finds her self in a legal battle for her life. Short of a miracle, Edward will lose his life and she will be returned to Chance Macy. Very few books bring me to tears, but I found myself with wet eyes in the final chapters of Price of Privilege. Honestly, I was unaware I had cared so much for the characters. Many times, I found Julia exhausting and the ongoing crisis energy depleting. There are few joyous moments of relief. (Think Wuthering Heights sprinkled with a little Jane Austen.) In the end, Dotta brings everything to a close in a surprise ending I never saw coming. I would be delighted to see this book made into a movie, preferably by the BBC.